The Lady Spartans Volleyball team has been amazing since the beginning of the season, with only a handful of losses, they worked their way up to the Class LL State Semifinal in Fairfield on Wednesday night and shut out the No. 3 seed Westhill High team. Both teams played their hearts out, but No.10 seed Amity was just that much better this time around, stunning their opponents with three wins (26-24, 25-23 and 25-20). Even though the Lady Spartans won 3-0, it was no walk in the park. Every game was a nail-biter for players and fans alike. In Game 1, Amity led by 3 to 4 points for most of the game but Westhill used its skills to tie them at 23-23 and 24-24. Then Amity kicked it into high gear to win 26-24. In Game 2, Westhill made us sweat with massive leads of 8 to 10 points, but when they got to 21-18 Amity forged ahead to win 25-23. In Game 3, Both teams played their “A” game but Amity pulled off a 25-20 win to advance to the state final against No.12 seed Darien at East Haven High School on Saturday at 10 a.m. This is the second consecutive title game for Amity, which lost to Greenwich in 2017. I would love to see Senior Captain Abby Harbinson celebrate a State Championship Title for everything she’s given to the team during her high school career. We will find out on Saturday. GO SPARTANS! The Amity Lady Spartans Volleyball team had a phenomenal season 22-2. This year, the teams’ accomplishments included SCC Championship, Player of the year, Coach of the year, and LL semi-finalists. On Wednesday, Nov. 16, Amity took on Stamford in the CIAC State Semifinal at Trumbull High School taking their second loss of the year 3-0. Stamford went on to win the state title against Ridgefield 3-1. Luckily, we will still have Abby, Dani, Jaiden, Brooke, Amelia, and a lot of other talent coming back in 2017. Who, under the guidance of Coach Davis and the rest of the coaching staff, Amity should be in great shape again. The Lady Spartans Volleyball team played against Stamford in the CIAC State Semifinal tonight at Trumbull High School. As most of you know, Seth Davis’s team only lost ONE match all season, proving time and time again that with the right coach and a team full of talented players you can really go places. Amity is amazing and gave fans and themselves a season to remember. But all good things must come to an end, and the semi final was the end of the road for our girls. Notes: Kathleen Walsh had 14 kills, Abby Harbinson had 9 kills, Jessica Ferraiolo had 6 kills, Jaiden Williams had 30 assists, and Dani Nordyk added 11 digs. Congratulations to Stamford on their 3-0 win —25-16, 25-20, 25-22 — you defeated one hell of an awesome team. Good luck in the championship game this weekend. Kathleen, Abby, Dani, Jess, Jaiden, Brooke, Taylor, Amelia, and all the players and Coach Davis, we are all so proud of you, and thank you for sharing your talent with us this year. The Lady Spartans Volleyball Team hosted the Woodland (Beacon Falls) Hawks in Woodbridge on Thursday, Oct. 27. The Hawks swooped in and won the first game 25-22, but Amity quickly regrouped and handily won the next three, 25-14, 25-15, 25-16. Yes, that’s right, Amity victory number 17 — 3-1 over Woodland. Amity: Kathleen Walsh 18 kills 15 digs, Jessica Ferraiolo had 4 kills, Jaiden Williams had 45 assists, and Taylor DiRienzo 6 digs. Woodland: Lindsey Gabianelli 7 kills, 3 assists and 11 digs, McKenna Cronin 4 kills, 10 digs, Emily Brouilette 3 kills, 2 digs, 1 block, Maddie Hupprich 2 kills, 12 assists 10 digs, and Ally Mayne 1 kill, 21 digs. Records: A 17-1; W 15-4. Coming off of its first loss of the season, the Amity Lady Spartans Volleyball team was more determined than ever to show Mercy High School their winning ways on Monday. 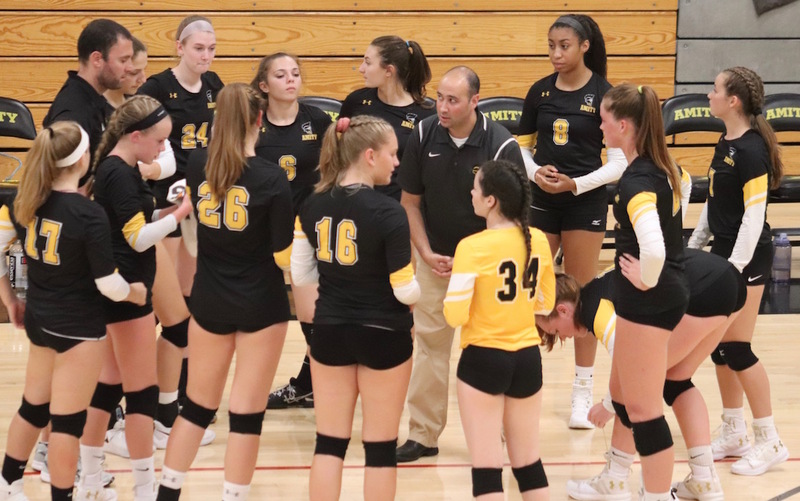 Amity hosted Mercy in Woodbridge and proceeded to demonstrate how the game is played, winning three games 25-12, 25-13, 25-19 and walking away with a 3-0 victory. 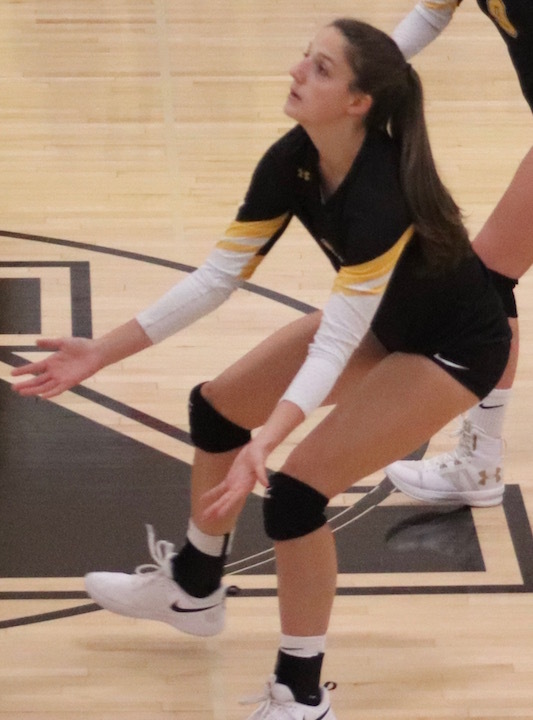 Notes: Amity-Jessica Ferraiolo had 6 kills, Jaiden Williams had 27 assists, Kathleen Walsh 10 kills 6 digs, and Abby Harbinson 8 kills 5 digs 4 blocks. Joining the fans at Monday’s game were Derek and Mara Graham, the parents of former Amity sports legends Elise and Janae. Amity Girls’ Volleyball is off to a good start. The Lady Spartans traveled to Westport to take on the Staples Wreckers on Friday. With coach Seth Davis at the helm, Amity performed extremely well, defeating Staples 3-2. The game scores were as follows: 26-24, 17-25, 24-26, 25-20,15-8. Amity’s standout players were: Kathleen Walsh had 13 kills and 5 digs with 1 ace, Abby Harbinson had 13 kills and 2 blocks, and Jaiden Williams had 30 assists. The 2016 Records: Amity 1-0; Staples -1. Expect more great things from this team for the remainder of the season.